I studied philosophy, so I know you are reading this, or at least you think you are, but I don’t know why, or whether you have done it before, and if so, how often. If you have read none of the proceeding 42,000 words, what I am about to discuss may seem a little unexpected, but I am trying not to repeat myself, and besides, those who have bravely trudged through it all deserve some reward, so I am going to give a brief glimpse of what's coming up in the next 30 posts, because from now on it’s going to get ‘interesting’. In terms of ‘why I blog’, this is my belated contribution to an interesting Internet discussion. It also reflects my concerns about how I blog. So, before we go any further, it's important we have a heart to heart about what’s going on here. We are meeting in rather unusual circumstances; my concern is what is going on in your mind when you read this, and you may be beginning to wonder about what’s going on in mine. – since this can overrule other forms of reasoning. 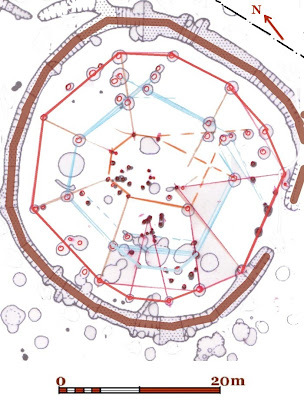 Thanks to the work of some excellent artists  and experimental archaeologists, you have seen, and may even have visited, Iron Age roundhouses, as well as experienced them realised in digital and other forms on the net. If you mentally answered ‘yes’ to any of that, contact a doctor -- you are older than think, or low budget air travel has reached the Iron Age. It is important to keep in mind that ideas about the prehistoric built environment are largely made up: The roundhouse with a central hearth, in the contexts we about to discuss, is a complete fiction, a fairy tale. The fact that this myth is regularly trotted out by everyone from professors to TV archaeologists does not constitute evidence of its veracity; that is not how archaeology is meant to work. What I am going to do next, is ask you to suspend belief in just about every image you have ever seen of the built environment in prehistoric England -- as well as much of what you have read, since increasingly ‘theoretical’ (?) archaeologists in universities have based their ideas about buildings on these images and visual conventions, rather than any real appreciation or analysis of the structural evidence, such as at Springfield Lyons [left] . So who am I to presume to mess with your preconceptions? The smart answer is: I want you to learn to mess with your own. Automated tests  rate this blog as grade 7–8 for readability, which I think means that it could potentially be understood by a 12-13 year old (insert own joke here). Although thinking about gravity, structures, and trees may be unfamiliar to many archaeologists, I want this archaeology to be understood, and its methodology used, particularly by my colleagues in field archaeology. I want you to be able to think ‘structurally’ about the evidence, know what questions to ask, and feel confident about this aspect of site interpretation; otherwise, some people will just continue to it make up as they go along, and besides, it’s a waste of time archaeologists' putting plans in books if people don’t understand them. 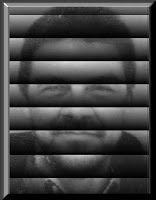 I am the archaeologist who came in from the cold, chilled world of commercial server rooms, bringing with me nearly twenty years of research. I sought shelter in my local university, only to find that my knowledge is of no value, because I have no value -- I do not attract funding -- I am worthless. Which is pretty much how I was treated; it’s not that they did not believe or understand theoretical structural archaeology -- they could not even be bothered to listen, even after I gave them all my money, so I hit upon blogging as the only way forward for my research. This way I get a self-selecting audience, who are most welcome to join in and comment, and no money changes hands. Thus, Theoretical Structural Archaeology occupies a strange space beyond the academic firewall, your host is a worthless individual, and nobody has been paid to check that I’m not lying to you, and so you're just going to have to use your own judgment, which, as I said earlier, is actually the whole point. I should also mention that I have recently been diagnosed as dyslexic. I have a very poor visual memory for words, which has blighted my education, and this makes writing and reading this blog much harder than it really ought to be. I am truly sorry folks! It must be irritating for you, but it’s equally demoralising for me. It is unfortunate that such a central and important topic as structural interpenetration has not been worked on by somebody literate, and more acceptable to the academic system. It would saved me considerable heartache; I could get a life, and you would be doing something else at this moment. If you are comfortable with your vision of the past, or have made a contribution to its creation, I can only apologise for taking on your preconceptions, current theories, and individual ‘authorities’; although the question still remains: how best to proceed? Here is my problem: I study postholes, site plans, and the archaeological reports where they are found. I consider them to be evidence of the built environment, and thus central to our visualisation and understanding of the past. The more I have studied, the more my view has diverged from the ‘conventional view’. I have tried being polite and deferential, and nobody listened. But postholes are my field, and some rather strange people have parked their flabby intellectual backsides on my turf, which is unfortunate, but mostly for them. I have to say that I am itching to charge in behind the shield of Internet freedom and hack into the soft sagging underbelly of back of the beer mat archaeological theorists with my rapier wit, bombarding them with a torrent of mixed metaphors until they had not got a ritual leg to stand on. But wiser councils prevailed; so I’ll do that next week. 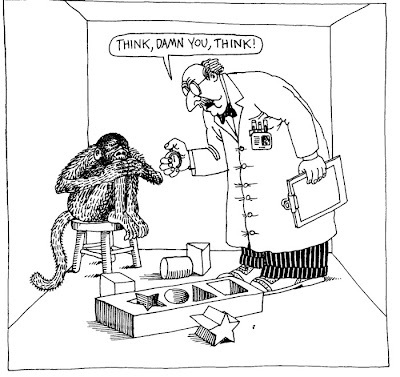 So I am back to where we started: how to persuade that your vision is wrong? I could give you another 40,000 words of ‘try looking at it this way’, gradually widening your perception and thinking on what constitutes a realistic built environment, slowly eroding your belief in the consensus. Or I could go for shock; Buddhists do all sorts of things to the bodies and minds of young monks to break their conditioning, ranging from the sound of one hand clapping, to a good slapping; I still favour a good humorous polemical rant. Edward de Bono, pioneer of lateral thinking, came up with the concept of ‘Po’ , something between and beyond ‘yes and no’, that allowed you transcend apparent contradictions, move arguments on, and find creative solutions to problems, so you may have to ‘po’ some of your ideas, or mine, for a while, so that they can coexist. Ultimately, the only motivation or incentive I can offer in return for attempting to trash your visual preconceptions is that you care deeply about archaeology and getting it as correct as possible is as important to you as it is to me. This will allow us to look in detail at the fundamental problem of finding structures in the first place, as well as interpreting them. In the real world of archaeology, things are not clear-cut, evidence is ambiguous, individuals make mistakes, things are missed; it’s very much the human way. Dealing with the evidence at this level, we have to accept its limitations, and not seek to simplify it for the sake of uniformity and correspondence with other sites. I will actually try to avoid discussing parallels; it’s for your own good. And we certainly won’t be mentioning aspects of tribal African architecture, unless someone finds a gene for roof pitch preference. The word ‘ritual’ will not be used (except as a term of abuse); if we don’t understand something we will say so, and not attempt to mystify archaeological features. To describe something as ‘ritual’ is often a formal way of expressing a lack of understanding, a declaration of ignorance; like superstition or religion, it is used to explain things that are not properly understood. From now on our only god is gravity. Every building I have ever considered has been in some way unique, although there are occasional shared idiosyncrasies in design which may, in the long term, prove to be of interest. In reality, we don’t have a very big sample. We will have to discuss roundhouses. Even though they are the one structure that is universally recognised, they have unfortunately been badly misunderstood and mythologized. I fully agree with the late great Peter Reynolds' experimental construct of Pimperne Down having a thatched roof and a wattle and daub wall. It’s only the overall form, structure, porch, roof pitch, and internal arrangement I think is wrong. 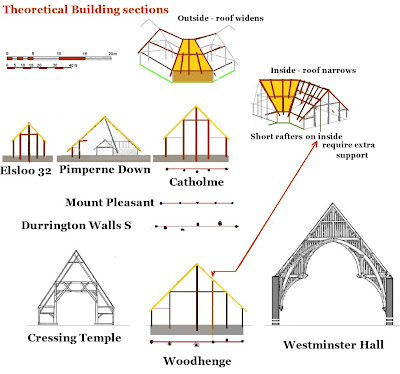 Conventional approaches to the evidence are based on the interpretation of the main elements of 3 recognised structural elements: wall, ring beam and porch. Additional features, often numerous, are ignored by this approach. 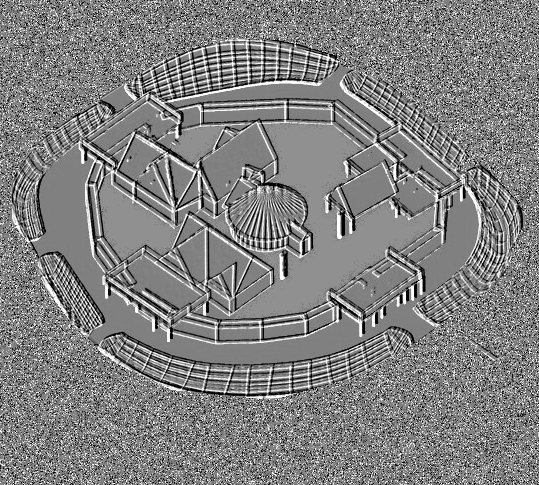 Two of the most important roundhouses we shall look at, Little Woodbury and Pimperne Down, were rebuilt, so there are two copies of the building plan. This allows us to detect the nature of the internal structures, such as the stairs. I am not claiming to understand the layout of any individual building, but I can show the probable disposition of some major components. We will have to think a lot more about roof structure, thrust, and, particularly, ties, since these support the upper floors. In both of these buildings, if you are following the basic structural principles, the porch is the same height as the ring beam. One structural consequence of a tall porch is that the wall will have rise as it approaches the porch; its foundation will become deeper and more substantial as at Longbridge Deverill (left), or there will be some other arrangement: at Pimperne Down, there is a gap. The only vernacular buildings I have come across with tall 8-10’ wide entrances are where access for two-wheeled vehicles is required, as in barns and cart sheds. In these large buildings in southern England, the stairs are inside the ring beam to the left of the porch. 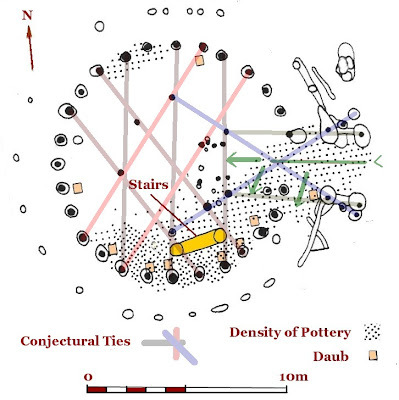 The distribution of pottery and daub at Longbridge Deverill , showing its relationship with the stairs. In addition, it shows clearly the separation of inner and outer areas on the ground floor. The main door and entry area is wide enough to allow vehicular access, and the central area could be a byre or stable, with the peripheral area used for access or storage. We have already considered the structural limitations of the conical roof: ground floor areas greater than 200m² are difficult to achieve. While this is fine for most families, parties, and having the relatives over for Christmas, most cultures, certainly those in more temperate climates, require roofed space for larger-scale social activities. We must not forget we dealing with elites: it’s important to have big buildings. Once you have men with swords, you are dealing with the archaeology of fear, and fortifications were usually made from timber in prehistory. 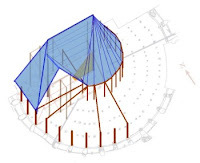 Most buildings are missed because archaeologists are looking for specific things; at Gussage All Saints, Geoff Wainwright was looking for roundhouses, so he missed the main late Iron Age structure. It. The Gussage All Saints building belongs to a class of annular roofed structures with ancient antecedents and has a massive timber outer wall set in a trench, topped by an annular roof. It is defensive in character, and in common with structures of this type, it’s not clear how the central space was treated. It could have been open, but it’s also the ideal place for the stairs. Understanding [reconstructed] building scale: Similar in structure to early Neolithic farmhouses like Elsloo, Netherlands, late Neolithic buildings like Woodhenge, Durrington Walls S, Mount Pleasant and Catholme are not prohibitively wide, compared with Peter Reynolds' Pimperne Down roundhouse reconstruction, and are over-designed by comparison to medieval examples like Cressing Temple Barley Barn and Westminster Hall. Buildings in this type derive from a class of Late Neolithic and early Bronze Age buildings known as type Ei , like Woodhenge, which are believed by some archaeologists, for no structural reason that I can ascertain, to be free-standing ‘timber circles’. Granted they are big, and built at the limit of what is possible with native trees, but that’s the whole point, and what architecture is about at this level. 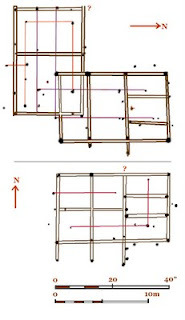 Plan and theoretical model sketch section of Navan Fort, County Armagh, Ireland. An annular roof with a taller conical centre, which merges into a (radial) pitched roof on the western side. This covers the main W-E hall on the ground floor, leading to the main stair under the central conical roof. (Post thickness enhanced). While on the subject of timber forts, and as a present to readers in Ireland, who have been some of the first to open diplomatic relations, the timber fort at Navan, Emain Macha, Co. Armagh, dated to 95BC, had a roof still fairly close in concept to earlier structures. It is similar in date to Gussage All Saints, but built on a much grander and more massive scale, with a very interesting ‘staircase’ feature; whatever was going on there, it was happening upstairs. 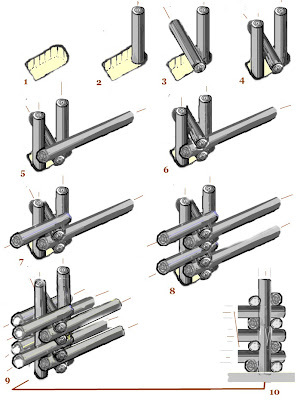 The illustration shows the basic form, but without more work on posthole depths, consider it ‘provisional’. We shall also look at the evidence for rectilinear buildings. In 1990 I wrote an interim structural report on the late Bronze Age fort at Springfield Lyons. 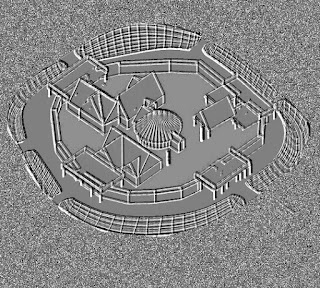 The key stumbling block for the county archaeologist was that the site had circular and rectilinear buildings, these being mutually exclusive architectural concepts in his mind. 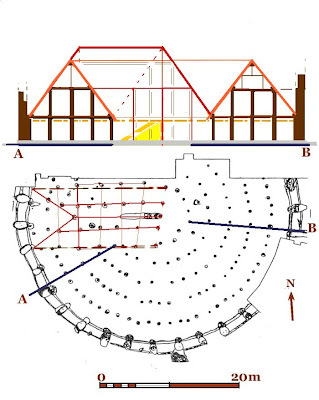 The interesting thing is that the architecture is based around a central roundhouse, with specialist rectilinear buildings probably integrated into the box rampart walls to form what is effectively a small timber fort with multiple entrances. This site has produced more evidence of weapons production than most the rest of the country put together, probably associated with the building behind the main roundhouse, which has a smoke bay. 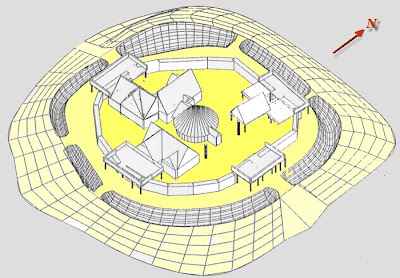 Continuing to regard it as “a farm possibly with ritual uses”, is not logically sustainable, although it does have two free-standing features at either side of the roundhouse. We will be looking at identifying floors, windows and the details of roof form. Sketch plan of the principle rectangular buildings at Springfield Lyons. [left] The one above has a smoke bay, and is probably associated with weapons production. One of the most exciting aspects of this architecture is that it has ‘Classical’ proportions: the modules measure 40’ x 25’ or 8:5. 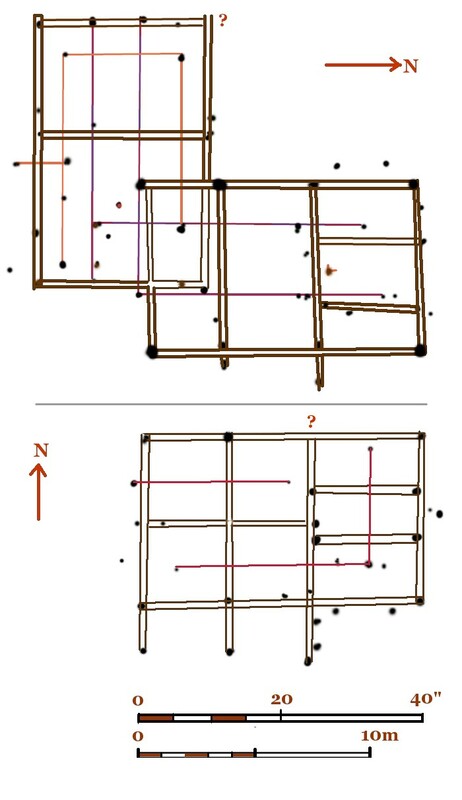 It is one of many sites I have been horrified to discover ‘work’ quite adequately in ‘imperial’ feet; once you start understanding structures in detail, you are in a better position to start taking basic measurements. In general terms, in southern England, working at 1:100 scale, feet and cubits (18”) are excellent descriptive units for most buildings, but this does not work as well further north. We shall also look at two post-built Roman vernacular buildings from Orsett, unsurprisingly laid out in Roman feet. The elite have now moved on to mortared stone buildings like ‘villas’ and townhouses, but what the majority of the population did for housing outside the towns is less well known. Excavations, at Shield Road, Newcastle. 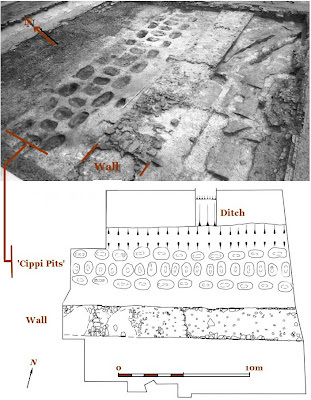 The three lines of double postholes in front of the stone wall mark the position of the earlier timber wall. It is fairly simple to demonstrate that these posts are the foundations of a timber wall constructed with standard sized timber baulks. It is well-attested at the eastern end of Hadrian’s Wall, and evidence suggests that the structure runs between the sites of the mile castles, with the ditch dug immediately in front of it. It must have served as a temporary wall and ditch during the six years it took to complete the stone structure, in much the same way that forts in this area were usually built in timber, and later consolidated in stone. 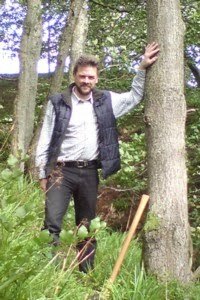 How to build a timber Roman Wall using standardised timber baulks, a step-by-step guide for the enthusiast. So those are a few of the headlines coming up in the case studies: animals downstairs and people upstairs, roofed social space, defensive timber structures, accurately laid-out functional architecture, and a temporary timber rampart, it’s not that surprising or far fetched. It is simply archaeology based on explaining features - not explaining them away. This study will never be complete, because every time I look at a new site plan, I find new things, and novel and intriguing questions arise. I have had to stop looking (seriously), and concentrate on consolidating. In a way, it’s lucky I no longer have access to a library, or I would never get anything finished. Once you have found a couple of Iron Age urinals, you have to just start looking for more, and then there are all those postholes at Stonehenge . . .
D. W. Harding, I. M. Blake and P. J. Reynolds, 1993: An Iron Age settlement in Dorsett: Excavation and reconstruction. University of Edinburgh. Department of Archaeology Monograph series No. 1. Archaeology has indeed more often than not been based on destroying what we believe and discovering how little both the trained and the amateur know, this being often because of our preconceptions entirely. True I am not the shiniest ball on the block so I would have to admit things go over my head many times perhaps a day but your use of images often helps even though I have no idea what a "commercial server room" is. Everyone has value, no one is worthless though the competition in intellectual studies often leaves noble thoughts in ruins for the aggressive ego of foe. I have enjoyed your Theoretical Structural Archaeology with your many humorous insights and look forward to your next 40,000+ words. Thanks Tim, hope you are enjoying summer up there. ‘Commercial server rooms’ are temperature-controlled environments where companies keep everything that hums, their commuters, data/voice switches, and other electronic infrastructure, and it is where I spent a lot of my time after I left archaeology. Universities are driven by money, - I’m a dyslexic with second class degree so I cannot be funded and don’t belong there – which is fair enough, however, it was not what I was told at interview, but I will leave that a tale of mendacious duplicity for another day. I glad you enjoy the illustrations and humour, I decided early to try to make it accessible as possible, and try to write as if I was talking or presenting. I suspect that those who go for complexity, obscurity, and lexicographical overkill, are trying to hide the simplicity and superficiality of their underling ideas and logic, but what I do I know – Like you - I don’t get half it. I personally stumbled across your blog a couple of months ago and added it to my saw sharpening pile. My field is computers and programming but I've always enjoyed architecture and basic engineering. Much of what you say makes a lot of sense to me, perhaps because I have no preconceived notions of how to interpret what archealogists have found. And I use this blog to make myself think, not only about the excellent points you make but also to remind myself to rethink the assumptions of my field. Thank you for taking the time to read and comment, it really helps to know that people read what you write and care enough to comment. Thinking is what this blog all about, interestingly, what I bring to archaeology, the things that makes TSA different, have come from outside archaeology. It all started because I worked for a council, by luck across the corridor were the people who dealt with the old buildings, and others who dealt with trees, it was access to different ways of thinking that allowed me to progress my approach to the evidence and set it in a local context. For the record I started with fortran4, and I do Access, and poor VBA, but dyslexics are dangerous to software, a very poor career choice; I love the creative bit at the beginning of software and application building, the rest of it is just a slog. I enjoy your writing very much, and am trying to follow the construction information, although it's a challenge for me. I especially enjoyed the quick tour through British history in the previous chapter. We don't study it much in America. I learned more about it in literature classes than in history classes. Thanks for reading, I enjoy writing about history, but it’s easy to slide off topic. I will be going over some of the constructions stuff again soon, (just for you! ), in posts 34 & 35 I will look again at the basics, in relation to Neolithic Europe; that’s the great thing about postholes, they occur in most periods in European archaeology. The wonderful thing about this form of publishing is that it can be interactive, so if it is felt I have not explained something properly, or missed something, I can react accordingly, so I am always happy to hear from readers. I stumbled upon your blog by accident and I must say that your approach and writing are compelling. I'm looking forward to your piece on roofed social space. Thanks Robbie, welcome aboard. Yes, roofed social is a biggie, everybody is wedded to the idea of aged bearded men in white diaphanous robes waving at the sky; but it is not good for the old folk to be out in all weather. Sorry, I am so slow with the new content, I find it frustrating, there I so much interesting stuff to look at; it’s the illustrations that take the time. Well, Geoff, Thank you for such a fascinating site and for your comments and ideas! You should feel highly valued, for such an effort. Keep it up, for our childrens' sake! I stumbled across your site via a link from digital digging. Having moved back to the Dorchester, Dorset area, and having too much time on my hands, I eventually tried to find 'Mount Pleasant henge (or is it 'hall') which hadn't really appeared on my radar before, despite having lived in Dorset for 14 years. Having found the field, I can understand why - no signs, no indications of its presence, and the field, after the full dig 40 years ago (in 1970/71), is still being ploughed, and is presently being covered by a spreading of manure - what great conservation! It was just possible to determine the remnants of and earth bank, and soil markings when viewed from the next field. There is no great emphasis on it in the County Museum, either. And yet Mount Pleasant must be of major significance, especially with its close location to Maumbury Ring, and the massive Greyhound Yard timber ring in Dorchester. And that's an illustration of how we treat archaeology and archaeologists – it was an interesting exercise! End of exercise. The field should be out of agriculture, with a visitor centre, car park and 100,000 visitors a year adding to Dorset's economy, and perhaps jobs for you and others. (Yes, I know it is commercialisation, but that's what pays salaries and funds further research, and conserves what we have found). There are plenty of people looking for places to spend their money and educate their kids – especially in the rain, in summer, in Dorset, and plenty of other places too. What would you do if only you could find the funding? Thanks for taking the time to read and comment, that's what makes it worth the effort of writing. The problem with Mount Pleasant, like a lot of complex sites, its architectural component was not fully understood. I hope to look at it in more detail in the future. It is at least one very interesting building. When I explain Woodhenge, I think it will put this site into perspective. It does not solve the problem of how interpret and present this type of site to the public, but I hope it will give the artists and model makers something to work with. Wow, I wish I'd stumbled accross this thirteen years ago whilst doing my MA. I have a background in building, and when I started doing Celto-Roman studies I became convinced that standard interpretation of post hole data was erronious to say the least. I have a strong interest in experimental archaeology, but find that this also has become bogged down by industry preconceptions and is now as closed-minded as many of our other Ivory Towers. What a refreshing read. And yes the henges were roofed structures I'm with you there. As my Dad used to say when I was theorising to him (he'd been in the building trade for fifty years) "Just remember king and queen posts and that your purlins may not be where you think they are, and there is suddenly a wealth of things you can do with it all"
So pleased to read your comment, thank you so much. 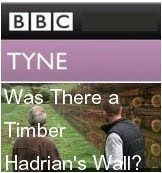 All archaeologists should talk to builders. I hope he is still with us, he would just love what lies behind this research. I am just writing up the bit about Woodhenge, which I hope will explain precisely where the purlins were, and put this beyond doubt. I have found out how it worked in detail, and once you understand how these structures are put together, the ground plans make perfect sense. It is called 'Interlace theory', and it works! I am sure I can explain this to a builder or an architect, - it is the Prehistorians that are the problem! I am very excited by what we will be able to understand about buildings in the future, there is a whole world of interesting architecture out there. However, the existing stakeholders are going to be horrified to realise they have been making up for years. I wish it could be otherwise, but some people are not going to share my enthusiasm. Thanks for the comment; that is an interesting project - I would be very happy to discuss the issues involved. 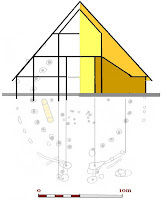 2. decide at the start to follow the evidence - not your visual imagination; I have been asked before about these structures - but what people really want is what everyone else has got - [an African mud hut]; the pseudo-archaeology which underlies a lot of "scholarship" about the subject. 3. If you want to understand the engineering, I can help, but is on an individual case by case basis, and only if the structure is of reasonable size with evidence of posts etc. You are correct in part about about timber shortages, which show up initially in the use of stone in walls - imo a broch is a very poor imitation of timber building. I have looked at "roundhouses" in the North and can tell you that in the highlands, they seem to use a different measuring system [foot '] to that used further south. PS. In this article, I am posing questions that I have recently answered - but there is no constituency for anything other than generic mud huts like in the pictures in our collective heads.